Luxury Locomotive of the Past! An idea evolves in your mind. Steam safari! And what is the cause? Standing there in its glory, the glory of the past, shining in its bright new colours of black and green. As you see it you imagine the royal comfort associated with the coach carriages of the 10th Class steam locomotive engine. In this case the No 156. In your mind’s eye you see yourself as part of a steam safari. The excitement rises and you lean forward to see clearly. Then suddenly you feel you must take a ride, must take a ride, …take a ride! “Princess of Mulobezi” is the name given to the newly reconditioned old 10th Class steam locomotive engine. On November 18, 2002 the locomotive bellowed its dolorous sound in the quite of the morning signaling it was up once again. It slithered out away from the Livingstone Railway Museum. The railway coaches had been redecorated to the original décor in every minute detail. The ideal was to capture the luxury of those bygone times. Located at the former Zambezi Sawmills Railway Locomotive shed, the Railway Museum exhibits rare steam locomotive engines and rolling stock. These exhibits date back to the earliest days of Zambia’s history and include the complete Zambezi Sawmills Railway line, once reputed to have been the longest private railway line in the world. Railway Museum is now home to scores of derelicts of the early railway transport in Zambia. These derelicts date as far back as 1880s. They’re the real centenarians emanating from the turn of the previous century. Steam safari is the new craze of the Adventure Centre in Livingstone. Riding steam locomotive, albeit popping black and white smoke, is an exciting safari. You’ll see the world from the security of the old comfort, the great luxury of the by-gone era. 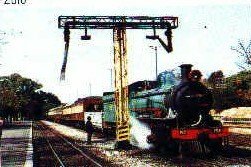 In 1991 a group of 141 steam enthusiasts visited the Railway Museum in a 20th Class steam locomotive from Zimbabwe. Since then several steam safaris have taken place. A major steam safari success story in Zambia was in 1994 when 47 steam enthusiasts aboard the Trans-Limpopo Steam Safari arrived in Zambia. The safari was organized by the South African Railways and Steam Museum. They travelled on the railway steam tour of three countries; South Africa, Zimbabwe and Zambia. Take a taste of this craze, the steam safari in Zambia! Contact a local tour operator now! Your visa fees will be waived.